Wantdo Casual twill cotton jacket is designed for daily life. Imported shell Cotton fabric with upscale twill pattern for durability and longevity. Generously cut through chest and armhole offers a unique style meanwhile allowing you to move through freely. 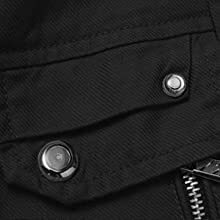 The First Wantdo cotton jacket was originally made with durable cotton shell and lining. It is a very basic jacket, the stand collar with zipper decoration and D-ring closure is one of the best way to protect body and neck. We are committed to designing clothing that comforts your body. Chest 43.31" 45.67" 48.03" 51.18" 54.33" 58.27"
Shoulder 18.90" 19.69" 20.47" 21.65" 22.83" 24.02"
Length 27.56" 28.35" 29.13" 29.92" 30.31" 30.71"
Sleeve 25.20" 25.98" 26.77" 27.56" 27.95" 28.35"
Stand Collar with Zipper and D-Ring Decoration. 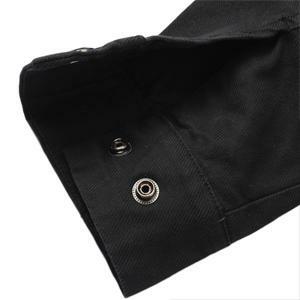 Snap Secured side slant pockets. 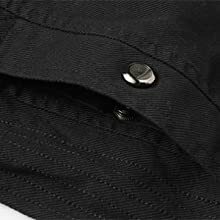 Secured Chest Pockets with Zipper Decoration. I’m 6’0”. 290lbs. Bust measurement is 50-52. Been loosing weight. Should I go 2x or 3x ? Choose your usual size, it's true to US size. I am about 5f 8ins and 154lbs, so what size should I order? I'm about 5'9" tall at 140lbs, athletic/slim build. I prefer a snug fit so would medium work okay? Yes that should fit great. I am 6'2" and 220 and I ordered the XL and it fits snug. 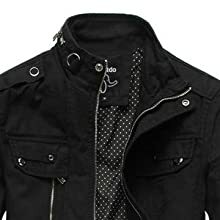 It is a great jacket you will enjoy it gets a lot of attention.